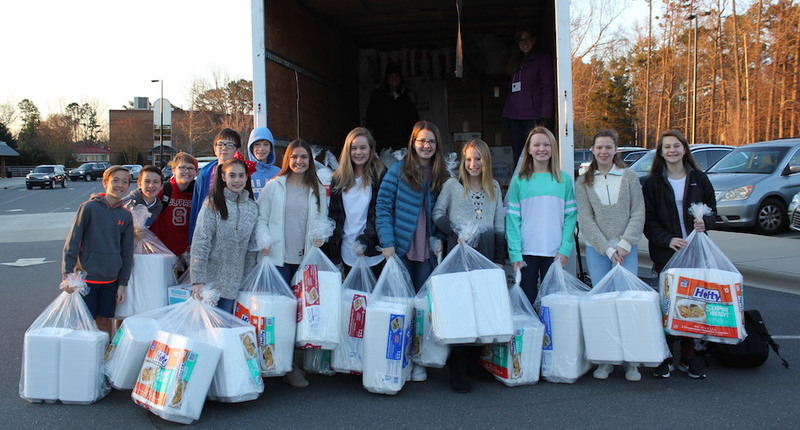 For 12 years, the Charlotte Christian community has rallied during Knights Fight Hunger Week to support The Harvest Center, a local ministry dedicated to helping homeless members of the Charlotte community. Through the years, truck loads of take-out trays, food service gloves, wrapped forks and napkins, canned food, and jars of peanut butter and jelly have made their way uptown to help neighbors in need right here in Charlotte. What began as Tailgate and Donate in 2007 has transitioned over the years to Knights Fight Hunger Week, an exciting event held every April under the leadership and guidance of the Parent Teacher Fellowship (PTF). It began modestly with canned food donations and clothing, and rapidly grew to providing essential staples like food trays, gloves, and more to help support The Harvest Center’s hot meal program. A year later, Operation Fork Wrap was introduced, a program that happens all year long and gives students from JK-12 the opportunity to wrap individual forks and napkins that are later used by patrons of the center. Currently, students wrap and pray over 20,000 wrapped forks each school year, enough to cover nearly every meal served by The Harvest Center in a year’s time. A group of Charlotte Christian parents also volunteer on a regular basis each month to help serve the meals and support the center in whatever way they can. In the spring of 2016, Charlotte Christian School was honored to receive the first annual Volunteer of the Year Award from The Harvest Center. The award was presented during a special ceremony at the dedication of their new facility and accepted by members of the 2015-16 PTF leadership team along with members of the Charlotte Christian School Development Office. Click here for more information for the 2019 collection.